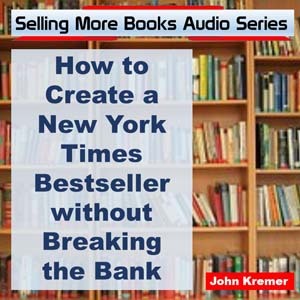 Are you ready to create a bestselling book? Do you want a book that everyone is talking about? Do you want to create a bestselling brand that builds your book from a simple paperback to a multimedia empire? You can do it. You just need a great title! To the next national bestselling author! That’s you! An effective book title alone can make the difference between a mediocre seller and a bestselling book. The title of a book, like the headline of an advertisement or news story, often makes the difference between a reader passing the book by or picking it up and giving it more careful consideration. 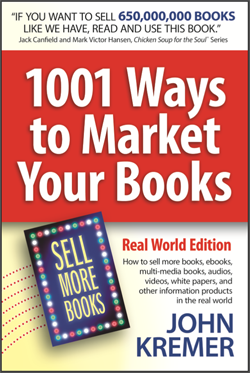 More often than not, the reader gives less than a moment’s attention to any book title; if you don’t capture the reader’s imagination or curiosity or desire in that short moment, you will have lost the sale. Does a title make a difference? Yes, it does! You can test your titles. Back in the 1950s, the Little Blue Book series tested all their titles. Which of these titles do you think sold best? The Art of Kissing sold more than 60,000 copies in one year while The Art of Courtship sold 17,000 copies. That didn’t surprise me. The Care of Skin and Hair outsold Eating for Health by 52,000 copies to 36,000 copies. 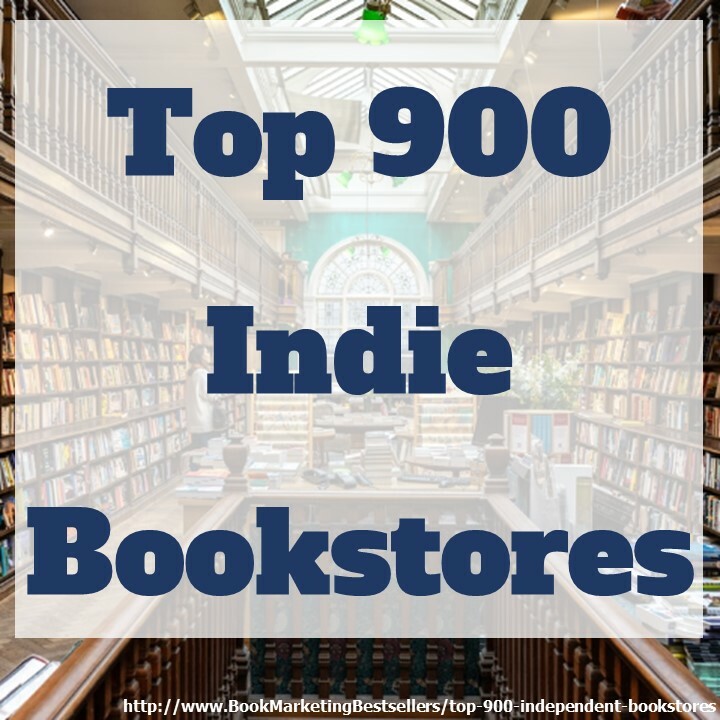 All four titles (with very little if any other selling copy or description) were exposed to the same number of readers the same number of times, so these sales reflect a really solid test of the titles — and how book buyers responded to them. You need to make your title memorable. That’s what I look for when I critique book titles. When John Gray followed up his bestselling Men Are from Mars, Women Are from Venus with What Your Mother Couldn’t Tell You and Your Father Didn’t Know, Borders returned 50% and Ingram 70%. Why? Because the second book didn’t have nearly as memorable a title. As Susie Russenberger of Ingram Book wholesalers noted, “The previous book had a great title, but this one was really hard for people to say.” When Gray began doing more Mars and Venus books, his books again leapt to the top of the bestseller lists. If you are looking to brand your book or want to create a bestseller, a book title critique will help you to create a bestselling book before you hire a cover designer (and spend up to $4,000 on a cover with a bad title). The Five-Minute Secret: How to Connect with Anyone, Anywhere, at Any Time! My Sweet Bride: How Mature Men Can Rekindle Their Marriage with the tag line: Psst: Ladies, Get Your Man to Read This Book! Book Title Critique: $150. But only $100 during Nanowrimo! Click Here to order . . .
One paperback publisher changed the title of a book from Five Days to Five Nights. The second title sold much, much better than the first. Tim Ferriss’s first title for his bestselling The 4-Hour Workweek was How to Buy Drugs Legally Online. Now his first title would have sold some books, but it would never have created a brand for Tim, nor would it have sold the millions of copies the current title has sold. The 4-Hour Workweek is brandable and memorable. His first title was generic and easy to forget. When Garden Way changed the title of one of their books from The Squash Book to The Zucchini Cookbook, sales rocketed from a paltry 1,500 copies to over 300,000 copies. They Don’t Build Statues to Businessmen to Valley of the Dolls—Which book sounds like a novel you could lose yourself in? The Pineapple Diet Book to The Beverly Hills Diet Book—The second is much more glamorous and enticing. Pineapples pucker my mind. The PRE-Reading Experience to Developing the Early Learner to The IQ Booster Kit—Note how the title becomes more specific while at the same time offering greater benefits. Which would you buy if you were a parent? Which do you think sold best? Tomorrow Is Another Day and Tote the Weary Load to Gone with the Wind—and the heroine’s name was changed from Pansy to Scarlett O’Hara. Which title do you think has sold millions of copies and become a major motion picture? Would the two original titles have done as well? A Grammatical Institute for the English Language (with an 18-word subtitle) to The American Spelling Book—Which title do you think sold best for Noah Webster’s first spelling book, published in 1783? A Story That No One Can Beat to And to Think I Saw It on Mulberry Street—Dr. Seuss’s first book was rejected by 27 publishers under that first title. When Ted Henle of Vanguard Press bought the manuscript, the first order he gave Seuss was to come up with a snappier title. He did. It Shouldn’t Happen to a Vet to All Things Bright and Beautiful—Not only was the second title more interesting, but it allowed James Herriot to come up with wonderful titles for the rest of the books in the series. Your Guide to Coping with Pain to Conquering Back Pain—The Canadian title was changed when Prentice-Hall came out with a U.S. edition so that the title would better reflect the book’s contents. And better reflect the American way of viewing problems. When Harvey Mackay was writing Swim with the Sharks Without Being Eaten Alive, he kept trying out different titles. He rejected Prepare to Win as too mundane and 88 Lessons for ’88 as too dated. Finally, he came up with a line from the book, How to Swim with the Sharks Without Being Eaten, which he liked because of its powerful symbolism which combined a bit of raunchiness with a sense of curiosity. If you are having trouble coming up with a good title, order my Book Title Critique service. 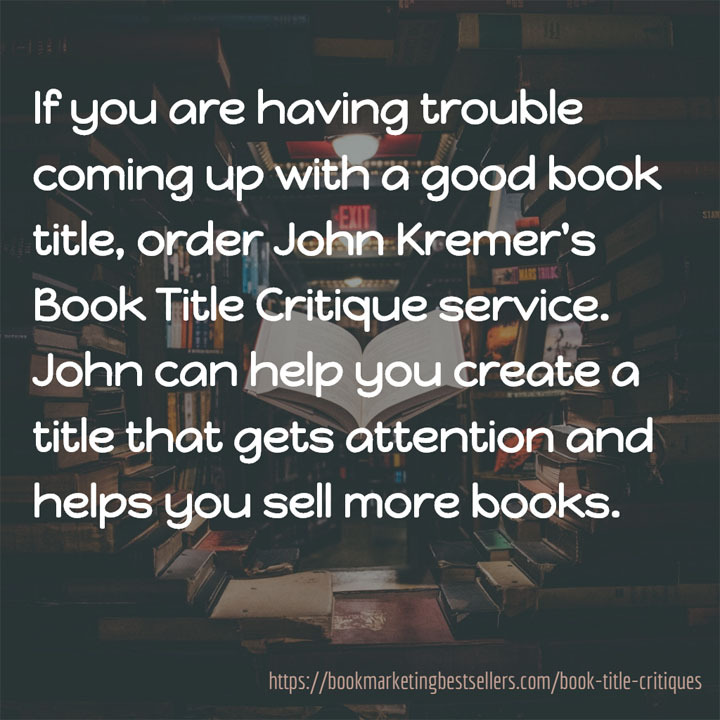 I can help you create a book title that gets attention AND helps you sell more books.